6th July 2019 - Elvis will be back in the building! On the back of 2 sellout shows here at The Masons we've tapped into Bob's busy diary and rebooked Elvis for July - This event is already over half sold out so book now to avoid missing out . Tickets are £35 each and include a 3 course meal , tea and coffee and plenty of Elvis entertainment. We are certain you won't be disappointed. ​Gin Festival - We're still working on a date for this years gin festival but on the success of the two we've run previously we will be back again with even more Gin . Over 50 varieties of Gin on offer and plenty of garnishes and tonics. Advance tickets get 5 gins for £20 so it's a bargain ! 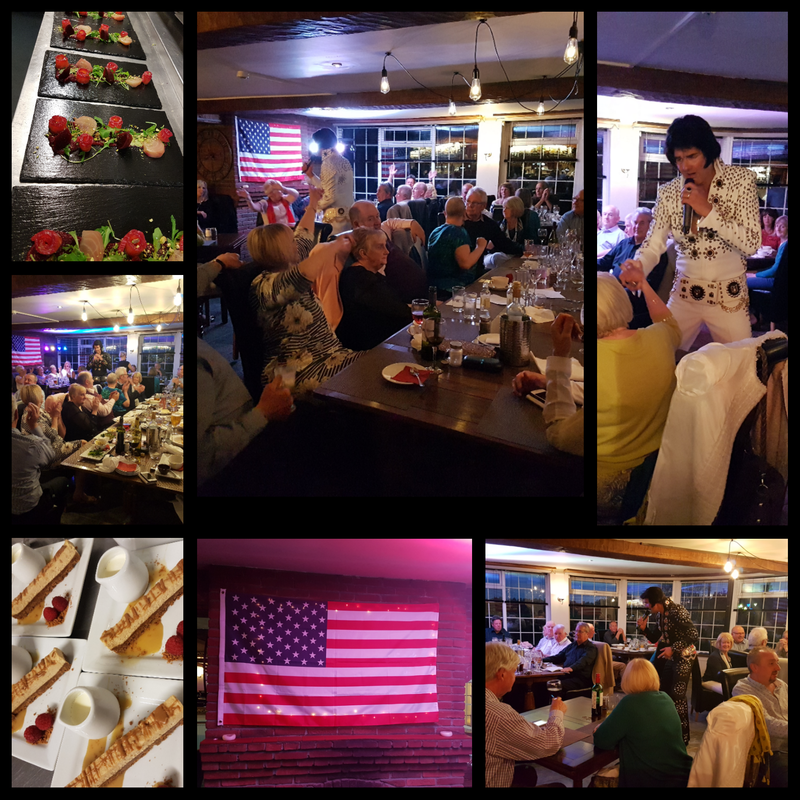 A fabulous night was had by all on our May Elvis night. By huge popular demand Elvis will be returning in December. 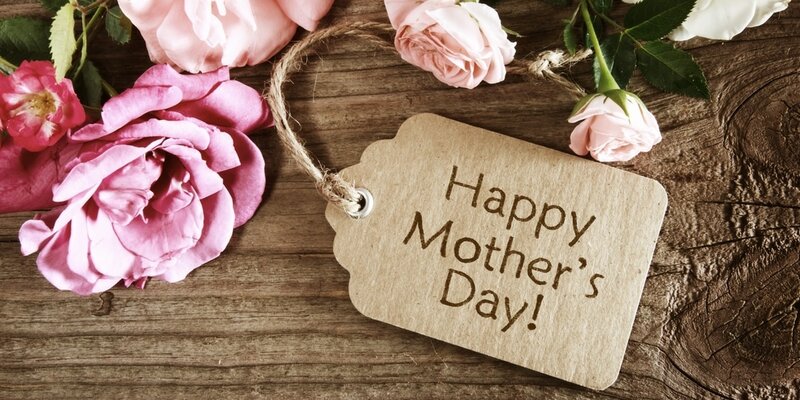 It's that time of year where we get to say thanks to our lovely mums for all their help and support. Treat your mum this Mother's Day ( which is Sunday 26th of March ) and earn yourself some brownie points ! We've a delicious menu planned with all the Sunday favourites and some treats for the whole family. Although we don't usually open on Tuedays we're making an exception on Valentine's Day to make sure we're here for all your Valentine's needs ! 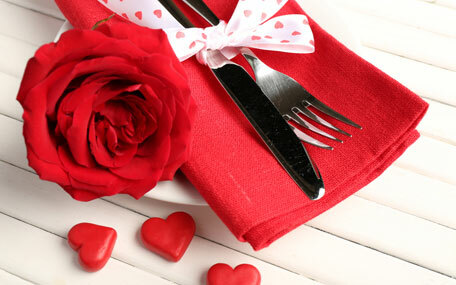 We are running our normal menu plus a variety of special valentine's themed dishes and sharers. The Masons is a great place to have your Christmas party -easy access for everyone just off the A1/A59 junction - lots of parking space and customers are welcome to leave their cars overnight when you get your carriages home! Our Festive Menu or is available to view here or under the menus tab on the website. 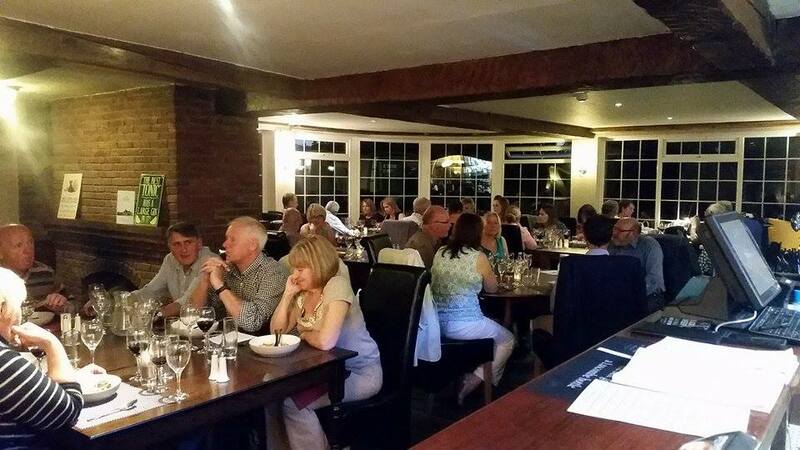 Give us a call on 01423 330 442 to book your table. We also have a special Christmas Day menu - Five courses for £65 with children under 12 half price. ​It might not be traditional to treat your Dad to lunch on Father's day but we certainly think you should! 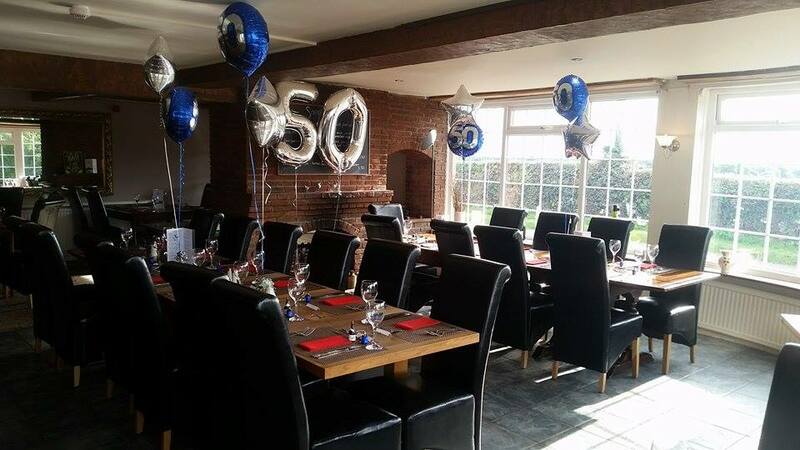 Your Dad definitely deserves it and where better than here at The Masons ? Get your diaries cleared and taxi's booked. The Mason's Italian night is back by popular demand. We have 5 beautiful courses and 6 wines to taste alongside these. Our fabulous wine rep Francois will be hosting the evening and answering any questions you may have about wine. There will also be plenty of time to relax and chat too. Valentines weekend is coming and if you don't have plans yet we'd love to see you. 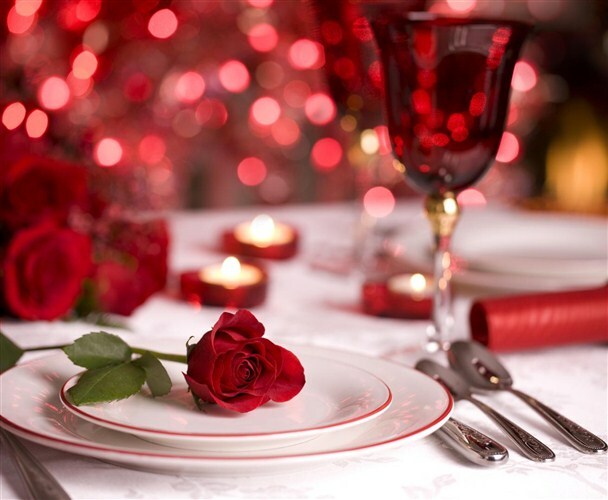 We will be running our normal evening menu alongside some special valentines sharers. Call us on 01423330442 to book your table. 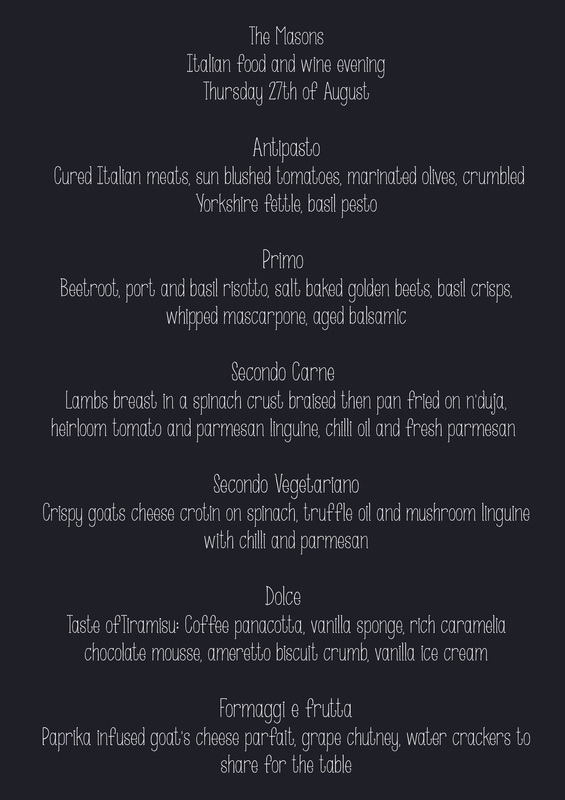 Our Italian night was a huge success and ended up fully booked. We are planning another one for April 2016 - watch this space for more information. The Masons is the perfect place for your next event or party. Please give us a call or drop us an email and we will work with you to meet your requirements. Small Conferences - We are happy to offer the use of The Masons for business meetings, small conferences or away days.